Here we present to you some information and photos from our chapters. Taken from Pinocotheca Gildica of the Acolyte Magazine #12. Adoration before a Solemn Procession. St. Vincent de Paul Church is the largest and one of the most magnificent churches the Society of St. Pius X possesses in the United States. 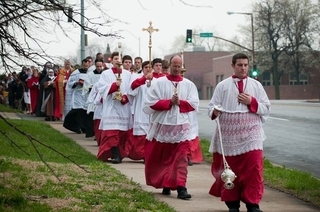 It is also home to the SSPX’s Kansas City, Missouri chapter of the Archconfraternity of St. Stephen, which has played an instrumental role for the Guild’s establishment in America. Palm Sunday procession – red cassocks are used to mark certain festive occasions (along with fancy surplices), otherwise black is normally worn. St. Vincent’s actually has two calls to fame concerning the Guild. 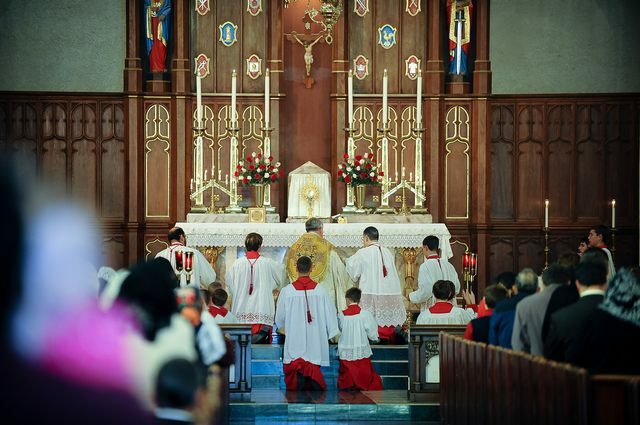 In early 1995, it was the first chapter started in the SSPX’s United States District. It also hosted the original office for the National Headquarters, then headed by its first (and current) chapter president, Louis Tofari, who was assisted by chapter members with various tasks such as filling chapter orders, publishing The Acolyte magazine, and general administration. Currently the chapter has 106 active members comprised of adults and adolescents, though several are away at other schools during the academic year. One of its former members, Mr. Charles Deister, is presently studying for the priesthood at St. Thomas Aquinas Seminary, while another, Fr. Daniel Dailey, was ordained to the priesthood in 2010. Several years ago, one of its young Master of Ceremonies, Richard Montgomery, passed away after a gradually-debilitating illness — R.I.P. At St. Vincent’s, great emphasis is placed on maintaining the Guild’s high standards of serving. 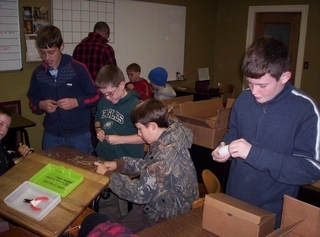 To accomplish this, the chapter has implemented an effective training program. The various serving positions are trained by specially-instructed trainers, and coupled with a rotating training schedule and the church’s extensive facilities, multiple classes can be efficiently offered on a given Saturday. The classes are thorough, teaching not just the basics of each position, but also the symbolisms and general principles behind the rubrics, thus fulfilling the third part of the Guild’s object: to learn what the ceremonies mean. One of the most important classes is for the Latin responses consisting of 5 consecutive sessions of nearly 3 hours each (almost 15 hours total). The postulants learn not only the more romano (translation) responses with their associated reverences and gestures, but also basic recognition-pronunciation skills, the meaning of the prayers, and how to render them at a moderate pace. Here some acolytes prepare the special-sized wicks that are inserted into the candles for Christmas Midnight Mass. Another important standard of the Guild the Kansas City chapter diligently enforces is the rank system—i.e., only Senior Acolytes serve those positions (e.g,. 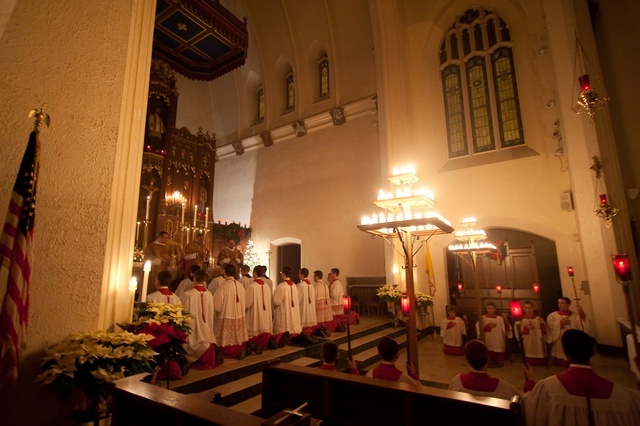 thurifer, acolytes at High Mass, etc.). Just one more implementation of the Archconfraternity’s wise directives that contribute to a consistent rendering of excellent service to the Divine King at the altar for His honor as well as the sanctification of the server. 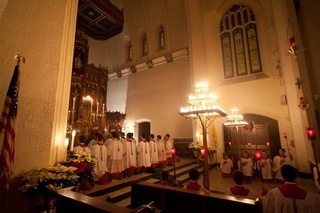 A glimpse of St. Vincent’s famous candlelight Christmas Midnight Mass during Communion. The members of St. Vincent’s chapter also benefit from regular meetings, conferences on the liturgy, and back in November 2011, the Senior Acolytes were specially treated to a day of recollection. Of course, there is also the fun in preparing St. Vincent’s famous Christmas Midnight Mass chandeliers and the annual St. Stephen’s Day Mass and Party.